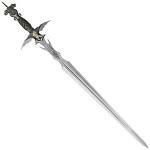 Fans of the Gladiator movie starring Russell Crowe will remember and admire this type of sword. Heavy but very efficient, the gladius became one of the main weapons of the Roman Legion's infantry. This Trademark Global Roman Sword recreates the old design in modern hand-forged steel. Scimitars like this CAS Hanwei version made the mounted cavalry of Arabia some of the most feared warriors of their day. Patterned after the Turkish scimitar known as the kilij, this detailed and accurate reproduction only reaches performance quality. 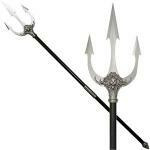 The Demon Guardian offers two weapons in this display version of a uniquel battlefield trident. 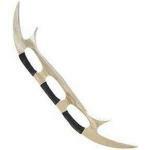 Leave it in one piece as the trident, or unsheath the hidden lance for dual weapon action. The Francisca Antiqued Axe from CAS Hanwei reproduced a genuine combat axe design used by marauding Viking warriors. Now a favorite of collectors and competitive axe throwers, this historically accurate axe would grace any wall. Around the camp, it's too good not to use. Shirasaya swords like this natural Hand-Forged Katana from Ryumon provide only the basics and leave the finishing touches to the new owners. Ryumon incorporates traditional materials and traditional construction methods in the set and includes a cleaning kit, display box, and informative reference manual. This high carbon stainless steel double sword set from Musashi takes a new approach to the two-sword fighting style of Musashi Miyamoto of medieval Japan. 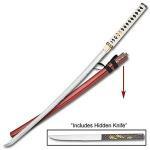 The single scabbard holds both a full-sized katana and a hidden wakizashi. Loosely inspired by the dual-sword fighting methods of legendary swordsman Musashi Miyamoto of Japan, this modern 39-1/8-inch-long katana with hidden throwing knife is hand-forged from 1040 high carbon spring steel. 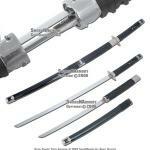 Musashi Swords rates this economical Zetsutsin katana as a light duty cutter, but the sword is also suitable for display. The Double Dragon Evolution Fantasy Sword from General Edge carries an unusual secret, but it's the sword's intricate design that really draws the eye. 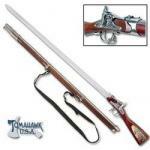 Made by United Cutlery, the Confederate States of America Rifle Sword honors the famous rebel General Robert E. Lee. The piece looks like a muzzle-loader rifle from Civil War days, but it's actually a sword cane.